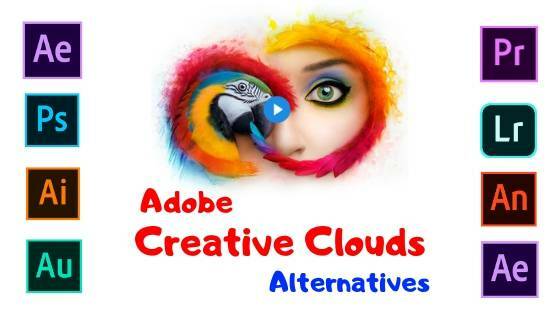 Adobe's Creative Cloud offers a great set of apps for creators of all levels with plans starting at around $10 per month.But I will explain Some Creative Cloud alternatives for many of the popular programs including photoshop, illustrator, lightroom, Premiere Pro and many other. ALTERNATIVES: RAW THERAPEE as the name suggests is great at editing raw photo files along with most other formats it doesn't offer the greatest user interface but it does include many of the same features as lightroom including non-destructive editing and batch processing it's available for Windows, Mac and Linux darktable is another Lightroom alternative that some people prefer over raw therapy in addition to its cleaner looking user interface it also offers non-destructive editing so your original images are never modified it can also import a variety of standard raw and high dynamic range image formats darktable is available for Windows Mac and the various Linux distributions. This is the king in terms of popularity when compared to other image editing software despite its awkward name the absolute. ALTERNATIVE : Best free alternative to photoshop is GIMP this professional quality image editor has so many features that you won't miss using Photoshop including layers effects filters drawing tools and a whole lot more it supports most of the popular file formats and plugins can be added to give you more control most people will agree that the interface has never been that great but a recent update has improved it quite a bit gif is available for Linux Mac and Windows. This is a vector graphics editor that's used to draw illustrations diagrams charts logos and other types of art when creating new artwork use illustrator or something similar a vector graphic will never lose its quality if it's scaled up or down if you work with vector graphics. ALTERNATIVE: The best free alternative that you'll find is Inkscape there are various tools for object creation and manipulation and it's SVG format file compliance makes it a suitable substitute for illustrator if you've used illustrator in the past you should have no trouble figuring out how to use Inkscape you can get it on either Linux Windows or Mac. This is an excellent tool for creating visual effects and motion graphics while there are no free alternatives that share the full feature set of After Effects blender is a powerful free tool that a lot of people use that can help to get you some of these same results as its adobe counterpart in fact. ALTERNATIVES: BLENDER is preferred by many professionals to create 3d visual effects and realistic animated graphics without knowing it you've probably seen a lot of the projects on TV or in films that were created using blender like many programs in this video blender is open source and available for Windows Mac and Linux. This is not as well-known as the others mentioned it's used in desktop publishing to create posters magazines flyers brochures and other types of documents. ALTERNATIVES: The best free alternative to InDesign is SCRIBUS. which has all the tools you need including thought management color profiles and also supports vector drawing tools it has a very similar layout of grids frames and layers making the transition from InDesign described as easier the latest stable release is available for all major operating systems. This is a timeline based video editing program that is very popular there are several great free alternatives here's a few have used that are recommended in the past shotcut is one of the easiest video editors to use with a ton of features all for free not locked behind a paywall it supports most of the popular media formats and even supports 4k resolutions it's available for Windows Mac and Linux also available for the three major operating systems is the easy to use. ALTERNATIVES: OPENSHOT VIDEO EDITOR it's packed full of features including no limit on how many layers you can have in your project and includes video transitions and DaVinci Resolve is a professional video editing tool that's been used to edit TV shows and these it supports most file formats and allows for multicam editing and advanced trimming the audio mixing capabilities are great as well with Fairlight audio built into the program the features and the free version of DaVinci Resolve will be enough for most people if you require multi-user collaboration along with other features including noise reduction the premium version will set you back 299 dollars. This is a digital audio workstation for recording and mixing audio for video podcasting and sound effect design. ALTERNATIVES: AUDACITY is the best free alternative to audition it's open source and available on every major operating system just about every feature you would need is included it supports a variety of file formats and plugins can be installed to add extra functionality to audacity it now includes different themes to change up the look including the stark theme which has a nice contrast and helps to reduce eyestrain. This is useful for creating animated content for cartoons games apps and other interactive content that can be published to multiple platforms. ALTERNATIVES: CENTAC studio for windows linux and mac is the best free replacement for animate this open source 2d animation program provides tools that produce high quality animations using less resources the manual vector tweening saves you the time and hassle of drawing each and every frame if you can afford to support the project you have the option to donate before downloading otherwise you can get it for free by entering 0 in the price. If this Article is useful for you Can share with others do you use a free program that's a great alternative to any of the Creative Cloud apps let us know about it in the comments.